Prepare gremolata first. Combine all ingredients using a hand blender, a kitchen whizz or mortar and pestle. Set aside. Lightly spray a chargrill pan or non-stick frypan with oil and heat over medium-high heat. Season fish with salt and pepper, and cook skin-side down for around 4 minutes or until crisp. Repeat on other side until cooked through. During this time, cook carrot, and risoni according to packet instructions. 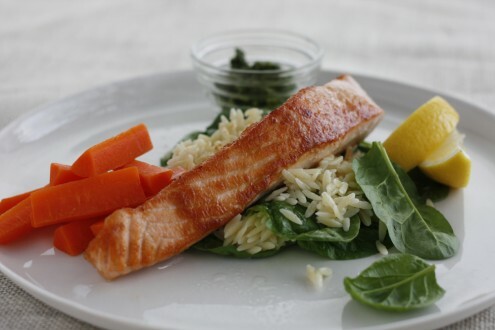 Serve fillets on a bed of spinach leaves and risoni (approximately 100g per person), topped with gremolata and carrots on the side. (Lemon wedges optional).